Potential authors and reviewers for TEEM will benefit by viewing a webinar that was held for potential contributors in July of 2013. The webinar can be viewed here on a PC or on YouTube at (https://youtu.be/kzoV3nO6-nY or https://www.youtube.com/watch?v=kzoV3nO6-nY&feature=youtu.be). The presentation can also be downloaded. Refereeing is not only a valuable experience and service to the profession, but is also an essential means to ensure that articles of high quality and relevance are published in a timely manner. To be eligible to referee (normally, only 1-2 papers/year), we invite you to send an email to [email protected] with the following information: (1) your full name, affiliation, and contact information [including email, phone number, fax number, and mailing address], (2) grade levels (e.g., elementary, middle, secondary, college) where you have teaching or research experience, and (3) thematic areas with which you have particular interest and expertise (to inform how the editors assign papers to various reviewers), and any other pertinent professional information. You will be provided with a reviewer form to guide and structure the refereeing process. We encourage the submission of quality papers, including applied or action research, literature surveys, thematic bibliographies, commentary on critical issues in the field, professional development strategies, and classroom activities and resources. While contributions in English are recommended to maximize the accessibility of the paper and to facilitate the reviewing process, TEEM will also consider contributions in languages such as Spanish.If any of the guidelines below present obstacles or raise questions, feel free to send an email to the Editors at [email protected]. The TEEM Editors also welcome query emails about the suitability of proposed topics or approaches. 1. Papers should generally be up to 10 double-spaced pages in length. Papers should be in Microsoft Word format, using 12-point Times New Roman font, 1” margins, and indenting the first line of each paragraph. This page limit applies only to the body of the paper and does not include the bibliography (references) section, abstract, DARE parts (see below), and any appendix. Reader-friendly short headings should be used to indicate the various sections of the paper. 2. Authors must provide accurate and complete bibliographical information. To this end, all manuscript citations should be listed at the end of the manuscript and must adhere to APA Publication Style (American Psychological Association). User-friendly explanations and examples of APA style can be found at http://www.math.utep.edu/Faculty/lesser/APA.html. 3. The paper should include an abstract of 50-100 words that summarizes the article. The submitted paper must also include one or two additional pages designed to help teachers or teacher leaders make best practical use of your article, organized with “before” and “after” components called Discussion And Reflection Enhancement (DARE) questions. “DARE Pre-Reading Questions): About 2-4 pre-reading questions that might help teachers reading the article (on their own or as an assignment from a professor or professional development leader) look for and frame the main ideas they are about to encounter in the material. “DARE Post-Reading Questions”: About 4-8 post-reading discussion questions that could be used in a group of teachers (whether in a graduate course or a teachers' lounge) to deepen teachers' understanding of the reading and provide a vehicle for reflection upon how the ideas or issues in the article could be used in or apply to their own classroom. In addition to or instead of discussion questions, additional readings could be suggested or even a “Try This” activity or technique that a teacher could actually try out in her/his classroom the next day. See examples in previous issues. 4. Before authors submit their paper, they should proofread it for grammar, completeness, and spelling of all proper names, and make sure any acronyms/jargon are spelled out and explained that might not be known to a broad audience. Also, because the peer-review process includes double-blind review by external referees, authors should remove identifying information from the paper(e.g., describe the setting or participants in a way that offers insight but does not reveal names of your school/city/participants; make sure the manner or frequency with which you cite your own work does not reveal your identity by taking into account how much your submitted article explicitly or exclusively depends on that prior reference). If you are still unsure how to handle a particular item with this issue, feel free to call it to our attention and we can suggest a solution before we send it out for review. Also, clear the file’s “Author” field under Properties so that there is no “metadata” associated with the file that names an author or institution; make sure Track Changes has been fully accepted, with comments deleted, and with the tracking showing “Final” as you turn off TrackChanges. 5. Authors should send their paper via email to the TEEM editors at [email protected]. The body of the email should consist of a cover letter that includes a 50-word author bio (following the style of examples from previous issues; see above links), any acknowledgments (e.g., of funding support), the title of the paper, and the full names, affiliations, and complete contact information [including email, phone number, fax number, and full mailing address] of all authors, making sure to denote which author has been designated to handle correspondence with the journal. The paper itself should be attached to this email as a single file. The file should consist of the following (in this order): Title of Paper, Abstract, DARE Pre-reading questions, body of article, References, DARE post-reading questions, and then any appendices. The file should be in Microsoft Word format (.doc file) and not .docx (or .xlsx, .pptx, etc.) to facilitate the work of our editors and reviewers who use a variety of computers. Authors must embed (with appropriate captions) any pictures, tables, illustrations or photos in the manuscript. They must obtain written permission when including student work or a photograph which clearly shows the student’s face or full name. The file size of the entire paper should generally not exceed 2-3 MB. Also attached to this email must be a signed “Author’s Disclosure Statement”. If the paper is a REVISION of a previously-submitted paper, the authors need to attach to the email a description of how the reviewer feedback has been addressed and what has been changed in the paper. Depending on the number/extent of the changes, this could be done by including a TrackChanges version of the paper with changes indicated, or a 2-column table could be made with each reviewer suggestion on the left and the corresponding change (or justification of why it was not changed) in the right column of that row. 6. We can receive papers at any time.After submission, you will be contacted by TEEM to acknowledge receipt of your paper and to let you know if any part of the submission is incomplete. a specific classroom-tested TODOS/TEEM-oriented “excellence and equity” activity (or piece of curriculum) accompanied by a camera-ready worksheet for classroom use - as appropriate, similar to NCTM’s Mathematics Teacher, Mathematics Teaching in the Middle School, and Teaching Children Mathematics that have a featured activity article with blackline master worksheet. 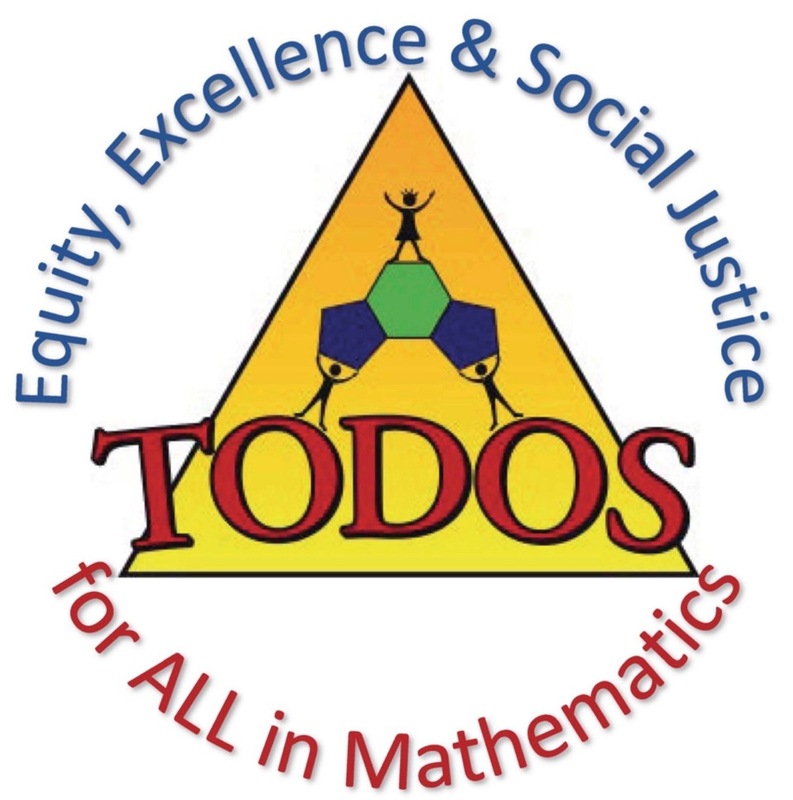 to implement lessons and programs that incorporate the role that language and culture play in learning mathematics. to inform the public, including parents, and influence educational policies in ways that enable students to become mathematically proficient. to inform teacher education programs.